The announcement a day before came as a welcome surprise to everyone who worked with GPS technology. The government had planned to remove selective availability – but had until 2006 to do so. Now, said the White House, anyone could “precisely pinpoint their location or the location of items (such as game) left behind for later recovery.” How right they were. London, Paris, New York, Beaver Creek? On May 3, one such enthusiast, Dave Ulmer, a computer consultant, wanted to test the accuracy by hiding a navigational target in the woods. He called the idea the “Great American GPS Stash Hunt” and posted it in an internet GPS users’ group. The idea was simple: Hide a container out in the woods and note the coordinates with a GPS unit. Within three days, two different readers read about his stash on the Internet, used their own GPS receivers to find the container, and shared their experiences online. Throughout the next week, others excited by the prospect of hiding and finding stashes began hiding their own containers and posting coordinates. Like many new and innovative ideas on the Internet, the concept spread quickly – but this one required leaving your computer to participate. 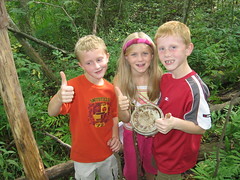 The combination of Earth, hiding, and technology made geocaching an excellent term for the activity. 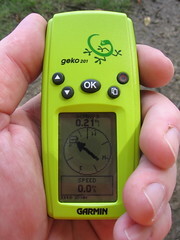 However the “GPS Stash Hunt” was the original and most widely used term until Mike Teague passed the torch to Jeremy Irish in September 2000. As with most participants, Jeremy Irish, a web developer for a Seattle company, stumbled upon Mike Teague’s web site in July while doing research on GPS technology. The idea of treasure hunting and using tech-gadgets represented the marriage of two of his biggest interests. Discovering one was hidden nearby, Jeremy purchased his first GPS unit and went on his first hunt the following weekend. With Mike Teague’s valuable input, the new site was completed and announced to the stash-hunting community on September 2, 2000. At the time the site was launched there were 75 known caches in the world. However, because there were so few caches in the world, many would-be participants discovered they didn’t have a cache listed nearby. Many wondered whether anyone would bother looking for a cache if they hid one in their area. The growing community chanted the mantra “If you hide it, they will come” to the newer players. After some reassurances, pioneers of the hobby started placing caches just to see whether people would go find them. They did.